Federal law and treaties, so long as they are in accordance with the Constitution, as well as the Constitution itself, preempt conflicting state and territorial laws in the 50 U.S. states and in the territories. However, the scope of federal preemption is limited because the scope of federal power is not universal. In the dual-sovereign system of American federalism (actually tripartite because of the presence of Indian reservations), states are the plenary sovereigns, each with their own constitution, while the federal sovereign possesses only the limited supreme authority enumerated in the Constitution. Indeed, states may grant their citizens broader rights than the federal Constitution as long as they do not infringe on any federal constitutional rights. Thus, most U.S. law (especially the actual "living law" of contract, tort, property, criminal, and family law experienced by the majority of citizens on a day-to-day basis) consists primarily of state law, which can and does vary greatly from one state to the next. At both the federal and state levels, the law of the United States is largely derived from the common law system of English law, which was in force at the time of the Revolutionary War. However, American law has diverged greatly from its English ancestor both in terms of substance and procedure, and has incorporated a number of civil law innovations. Notably, a statute does not disappear automatically merely because it has been found unconstitutional; it must be deleted by a subsequent statute. Many federal and state statutes have remained on the books for decades after they were ruled to be unconstitutional. However, under the principle of stare decisis, no sensible lower court will enforce an unconstitutional statute, and any court that does so will be reversed by the Supreme Court. Conversely, any court that refuses to enforce a constitutional statute (where such constitutionality has been expressly established in prior cases) will risk reversal by the Supreme Court. However, it is important to understand that despite the presence of reception statutes, much of contemporary American common law has diverged significantly from English common law. The reason is that although the courts of the various Commonwealth nations are often influenced by each other's rulings, American courts rarely follow post-Revolution Commonwealth rulings unless there is no American ruling on point, the facts and law at issue are nearly identical, and the reasoning is strongly persuasive. Early on, American courts, even after the Revolution, often did cite contemporary English cases. This was because appellate decisions from many American courts were not regularly reported until the mid-19th century; lawyers and judges, as creatures of habit, used English legal materials to fill the gap. But citations to English decisions gradually disappeared during the 19th century as American courts developed their own principles to resolve the legal problems of the American people. 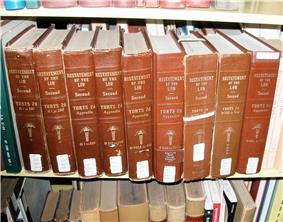 The number of published volumes of American reports soared from eighteen in 1810 to over 8,000 by 1910. 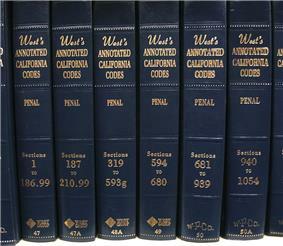 By 1879 one of the delegates to the California constitutional convention was already complaining: "Now, when we require them to state the reasons for a decision, we do not mean they shall write a hundred pages of detail. We [do] not mean that they shall include the small cases, and impose on the country all this fine judicial literature, for the Lord knows we have got enough of that already." 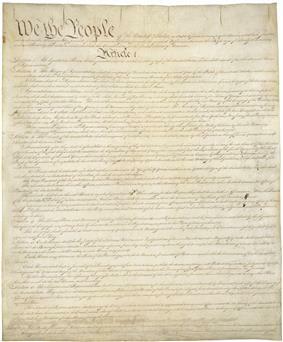 During the 18th and 19th centuries, federal law traditionally focused on areas where there was an express grant of power to the federal government in the federal Constitution, like the military, money, foreign affairs (especially international treaties), tariffs, intellectual property (specifically patents and copyrights), and mail. Since the start of the 20th century, broad interpretations of the Commerce and Spending Clauses of the Constitution have enabled federal law to expand into areas like aviation, telecommunications, railroads, pharmaceuticals, antitrust, and trademarks. In some areas, like aviation and railroads, the federal government has developed a comprehensive scheme that preempts virtually all state law, while in others, like family law, a relatively small number of federal statutes (generally covering interstate and international situations) interacts with a much larger body of state law. In areas like antitrust, trademark, and employment law, there are powerful laws at both the federal and state levels that coexist with each other. In a handful of areas like insurance, Congress has enacted laws expressly refusing to regulate them as long as the states have laws regulating them (see, e.g., the McCarran-Ferguson Act). 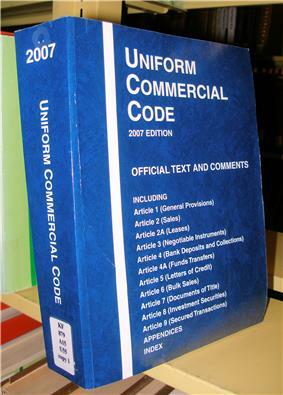 Regulations are adopted pursuant to the Administrative Procedure Act. 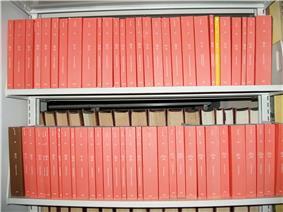 Regulations are first proposed and published in the Federal Register (FR or Fed. Reg.) and subject to a public comment period. Eventually, after a period for public comment and revisions based on comments received, a final version is published in the Federal Register. The regulations are codified and incorporated into the Code of Federal Regulations (CFR) which is published once a year on a rolling schedule. 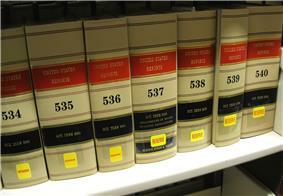 Most cases are litigated in state courts and involve claims and defenses under state laws. In a 2012 report, the National Center for State Courts' Court Statistics Project found that state trial courts received 103.5 million newly filed cases in 2010, which consisted of 56.3 million traffic cases, 20.4 million criminal cases, 19.0 million civil cases, 5.9 million domestic relations cases, and 1.9 million juvenile cases. In 2010, state appellate courts received 272,795 new cases. By way of comparison, all federal district courts in 2010 together received only about 282,000 new civil cases, 77,000 new criminal cases, and 1.5 million bankruptcy cases, while federal appellate courts received 56,000 new cases. Traditionally, lawyers distinguish between procedural law (which controls the procedure followed by courts and parties to legal cases) and substantive law (the actual substance, or principles of law, which is what most people think of as law). In turn, procedural law is divided into criminal procedure and civil procedure. Substantive law comprises the actual "substance" of the law; that is, the law that defines legally enforceable rights and duties, and what wrongful acts amount to violations of those rights and duties. Because substantive law by definition is enormous, the following summary briefly covers only a few highlights of each of the major components of American substantive law. ^ Tonya Kowalski, "The Forgotten Sovereigns," 36 FSU Law. R. 765 (2009). ^ Lawrence M. Friedman, A History of American Law, 3rd ed. (New York: Touchstone, 2005), 307 and 504-505. ^ Graham Hughes, "Common Law Systems," in Fundamentals of American Law, ed. Alan B. Morisson, 9-26 (New York: Oxford University Press, 1996), 33. ^ Friedman, 4-5. Professor Friedman points out that English law itself was never completely uniform across England prior to the 20th century. The result was that the colonists recreated the legal diversity of English law in the American colonies. ^ G. Edward White, Law in American History, Volume 1: From the Colonial Years Through the Civil War (Oxford: Oxford University Press, 2012), 48-51. ^ James B. Beam Distilling Co. v. Georgia, 501 Supreme Court of Georgia had stubbornly refused to retroactively apply a 1984 U.S. Supreme Court decision which had declared a Hawaii statute to be unconstitutional as a violation of the Commerce Clause, even though it was clear that the Georgia statute had the exact same flaw as the Hawaii statute. The high court reversed by a 6-3 majority. ^ See Casarotto v. Lombardi, 886 P.2d 931, 940 (Mont. 1994) (Trieweiler, J., specially concurring), vacated and remanded by 515 U.S. 1129 (1995), reaff'd and reinstated by 901 P.2d 596 (Mont. 1995), rev'd sub nom. Doctor’s Assocs., Inc. v. Casarotto, 517 U.S. 681 (1996). ^ U.S. Const., Art. 1, §§ 9 and 10. ^ John C. Dernbach and Cathleen S. Wharton, A Practical Guide to Legal Writing & Legal Method, 2nd ed. (Buffalo: William S. Hein Publishing, 1994), 34-36. ^ Antonin Scalia and Amy Gutmann, A Matter of Interpretation: Federal Courts and the Law (Princeton: Princeton University Press, 1998), 3-13. ^ See, e.g., Gomez v. Superior Court (Walt Disney Co.), 35 Cal. 4th 1125 (2005) (citing Lovett v. Hobbs, 89 Eng. Rep. 836 (1680)). The Gomez court relied on a line of cases originating with Lovett in order to hold that Disneyland was a common carrier. ^ See, e.g., Phillippe v. Shapell Industries, 43 Cal. 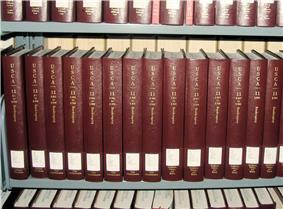 3d 1247 (1987) (citing original Statute of Frauds from England) and Meija v. Reed, 31 Cal. 4th 657 (2003) (citing Statute of 13 Elizabeth). ^ Elizabeth Gaspar Brown, "Frontier Justice: Wayne County 1796-1836," in Essays in Nineteenth-Century American Legal History, ed. Wythe Holt, 676-703 (Westport, CT: Greenwood Press, 1976): 686. Between 1808 and 1828, the briefs filed in court cases in the Territory of Michigan changed from a complete reliance on English sources of law to an increasing reliance on citations to American sources. ^ People v. Kelly, 40 Cal. 4th 106 (2006). ^ "Public and Private Laws: About". ^ Daniel A. Farber and Suzanna Sherry, Judgment Calls: Principle and Politics in Constitutional Law (New York: Oxford University Press, 2008), 70-71. ^ Frederick Schauer, Precedent, 39 Stan. L. Rev. 571, 595-602 (1987). ^ Choate v. County of Orange, 86 Cal. App. 4th 312, 327-28 (2000). 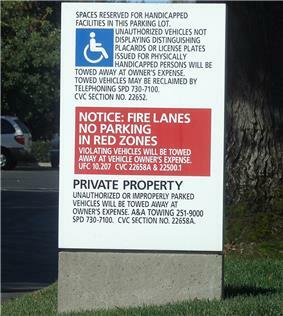 ^ Yee v. City of Escondido, 224 Cal. App. 3d 1349, 1351 (1990). ^ Olson, Kent C. (1999). Legal Information: How to Find It, How to Use It. Phoenix: Greenwood Publishing Group. p. 6. ^ Alan B. Morisson, "Courts," in Fundamentals of American Law, ed. Alan B. Morisson, 57-60 (New York: Oxford University Press, 1996), 60. ^ Office of Judges Programs, Statistics Division, Judicial Caseload Indicators (Washington: Administrative Office of the United States Courts, 2010). ^ a b Beth Walston-Dunham, Introduction to Law, 6th ed. (Clifton Park, NY: Delmar, 2012), 97-103. ^ Mark A. Kinzie & Christine F. Hart, Product Liability Litigation (Clifton Park, NY: Thomson Delmar Learning, 2002), 100-101. See also Greenman v. Yuba Power Products, Inc., 59 Cal. 2d 57 (1963). ^ Ellen E. Beerworth, "Australia," 51-74, in International Product Liability, vol. 1, ed. Christian Campbell (Salzburg: Yorkhill Law Publishing, 2006), 52. ^ "ALI Restatement of the Law Third, Torts: Products Liability". Ali.org. Retrieved September 23, 2013. Rabban, David M. (2003). "The Historiography of Late Nineteenth-Century American Legal History". Theoretical Inquiries in Law 4 (2): Article 5. Gerber, Scott D. (2011). "Bringing Ideas Back In—A Brief Historiography of American Colonial Law". American Journal of Legal History 51 (2): 359–374. Hoffer, Peter (1998). Law and People in Colonial America (Rev. ed.). Baltimore: Johns Hopkins University Press. Hart, H.L.A. The Concept of Law. (1961). Classic text on "what is law?" Llewellyn, Karl N. "The Bramble Bush," in Karl N. Llewellyn on Legal Realism. (1986). (Classic introductory text on the nature of law).